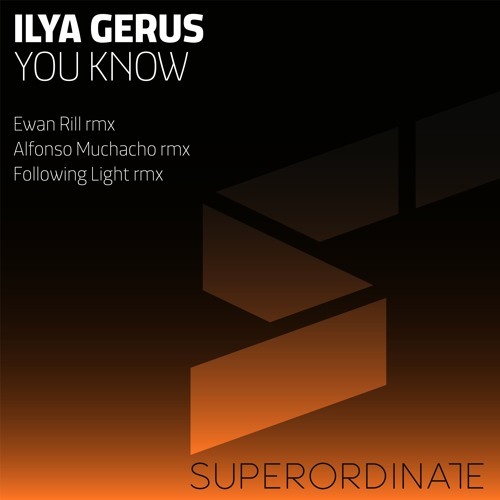 The latest release on Superordinate Music welcome Ilya Gerus back to the label for his debut single. The Russian artist first appeared on the UK imprint with a remix of Robert R. Hardy’s ‘Deytar’ in March of this year. Ilya now delivers his first single for the label entitled ‘You Know’ alongside remixes from Ewan Rill, Alfonso Muchacho and Following Light. The release begins with Ilya’s original and finds the Russian artist going deep and mysterious. Led by a murky bass line, haunting vocal samples and a dimly lit atmosphere it’s definitely one for late night play. Icy pads move over the piece along with flickering electronics for a very ominous yet somehow hopeful vibe. A unique and intriguing track from Ilya. The three remixes supplied here do a nice job at taking the original in different directions. Ewan Rill lifts the energy considerably with a radical revamp on the vocals and vibrant rhythms. A wall of twisted bass leads the way while soft synth hooks wrap around the groove. The main vocal eventually does drop and initiates a short break of phasing effects and methodical builds, perfectly setting up a groovy finale. Another brilliant remix from Ewan and one of my faves on the release. Next up Alfonso Muchacho fresh off his Stellar Fountain single takes the track into more dance floor friendly territory as well. Anchored by a deep, rolling groove Alfonso methodically builds a great framework with distinctive drum elements and trailing effects. The ominous vibe from the original is well maintained while the vocal gets a slight overhaul. A short break brings a moment of beauty before the vocal kills the silence and the beats return for a great moment. Lovely work from Alfonso once again. The release concludes with Following Light who brings a much different approach with several distinctive elements. From the plonky hits to offset percs and grungy low end it’s a groovy affair from start to finish. Easily the most emotionally gripping piece on the EP it makes for many spine tingling moments along the way. A spaced out break proves to be the ideal centrepiece and sets up a perfect close not only to the track but release as well. Great remix from Following Light and another great offering from Superordinate Music. Don’t miss it.